How are the birds doing? Ever since Rachael Carson revealed in the 1960s that pesticides were decimating bird populations, how the birds are doing has been an important question. DDT was the worst-offending pesticide, and it was soon banned, but other chemicals and other factors affect the ability of birds to survive. These days, the most important may be habitat destruction, competition from invasive species, and the effects of other chemicals, such as lead. Many, many bird species migrate. Those that do require habitats along the way where they can rest and refuel. Break the chain of habitats in even one place, and you seriously harm the ability of the birds to survive. Figure 1. Breeding Bird Survey Routes. Source: Sauer et al, 2017. The largest and most important survey of bird populations is the Breeding Bird Survey, which has been conducted every year since 1966. Here’s how they conduct the survey: during peak breeding season, starting 1/2-hour before sunrise, volunteers follow a route with 50 stops, each stop at least 1/2 mile apart. The route stays the same from year-to-year. The volunteer counts all birds of that species seen or heard within a quarter mile of the stop. Figure 1 shows a map of the routes. The routes look like blue dots because of the scale of the map. You can see that coverage of the USA is quite good. The results are mixed, differing from species-to-species and from region-to-region. As you might expect, even though the routes have 50 stops on them, and the method used is quite rigorous, it is not the same as physically being able to count every bird. Some of the birds may not be calling when the volunteer is there, or they may be hidden in brush, etc. The survey method does not permit a calculation of the absolute number of birds in a region, and the annual index is only reliable if a sufficient number of birds are observed. Thus, the Breeding Bird Survey provides crucial data, but it may be only part of the picture. Table 1. Breeding Bird Survey Trend Estimates for Bird Species Observed in Missouri. Data source: Sauer, et al. 2017. Trend data on how the annual indices for each species have changed is available for every species and for every state and region. I shall focus only on observations in Missouri. Table 1 shows the data. The trends are reported from 1966-2015 and from 2005-2015. The trends represent the annual rate of change over the period of interest. The table is a bit complex, so let’s unpack it. It shows all species observed in Missouri. They are listed in order of the change between 1966 and 2005, with species that declined on the left side, and species that increased on the right. 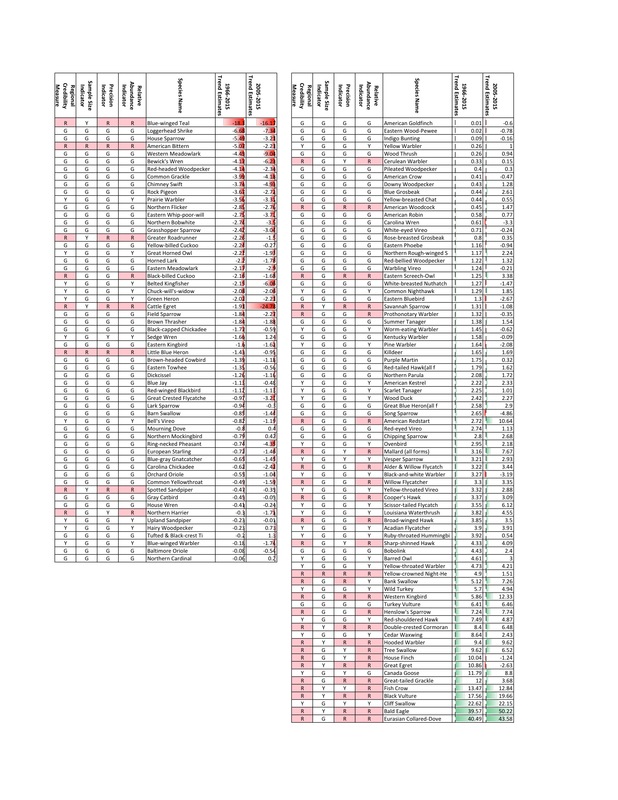 Each side of the chart begins with 4 columns intended to comment on the quality of the data for a given species. They are coded “G”, for green, or good, “Y” for yellow, or caution, and “R” for red, or extreme caution. The first column comments on the credibility of the measurement. The second column comments on the size of the data sample. The third column comments on how precise the measurements are. The fourth column comments on the relative abundance of the species. The trend statistics follow the names of the species, and they are color-coded with green and red bars, representing the size of the change. Readers of this blog know that time series are vulnerable to year-to-year variation, but the fact that these are trends computed over the entire period of measurement should minimize that effect. Between 1966 and 2015, annual indices for 58 bird species decreased, while 79 increased. If one counts only species for which the Regional Credibility Measure was “G,” then the situation is reversed: 40 species decreased and 31 increased. Those with declines of more than 5% were the blue-winged teal, the loggerhead shrike, the house sparrow, and the American bittern. The blue-winged teal declined at a rate of 18.1% per year, however the Regional Credibility Measure for that species is red, indicating that use and interpretation of the data for that species warrants extreme caution. The same is true for the American bittern. The Regional Credibility Measures for the loggerhead shrike and house sparrow, however, are good. Because 1966-2015 is a 49 year period, even small annual changes can accumulate to rather significant changes across the entire period. Any decline of 1.4% per year over 49 years would result in a 50% decline over the whole period. The loggerhead shrike, for which the Regional Credibility Measure is “G,” declined at an annual rate of 6.68% per year. Over 49 years, that computes to a decline of 97%! Among the success stories are some birds that are everybody’s favorites: bald eagle observations increased almost 40% per year, great egret observations increased almost 11%, and cedar waxwing observations increased almost 9%. With the bald eagle and great egret, however the Regional Credibility Measures are red, again indicating extreme caution in using and interpreting the data, and for the cedar waxwing it is yellow. These findings reinforce what was stated above: the Breeding Bird Survey provides crucial data, but it may not be a complete picture. Missouri is home to 9 federal wildlife refuges and hundreds of state conservation areas. All are devoted to providing animals and plants the habitat they need to survive. If you visit them on the wrong day, they often look empty, and you can come away wondering what the big deal is. If you visit them on the right day, however, they can be teeming. Figure 2, for instance, shows the afternoon lift-off of a flock of snow geese at Loess Bluffs NWR in northwestern Missouri. The snow geese are only there to rest and refuel for a few days each spring and fall. Figure 2. Snow Geese Lift Off at Loess Bluffs NWR. Source: Keyserill, 2017. Keyserill, Robert. 2017. “Afternoon Lift Off.” Source: U.S. Fish and Wildlife Service. “Loess Bluffs National Wildlife Refuge.” Downloaded 3/18/2018 from https://www.fws.gov/refuge/Loess_Bluffs. Sauer, J. R., D. K. Niven, J. E. Hines, D. J. Ziolkowski, Jr, K. L. Pardieck, J. E. Fallon, and W. A. Link. 2017. 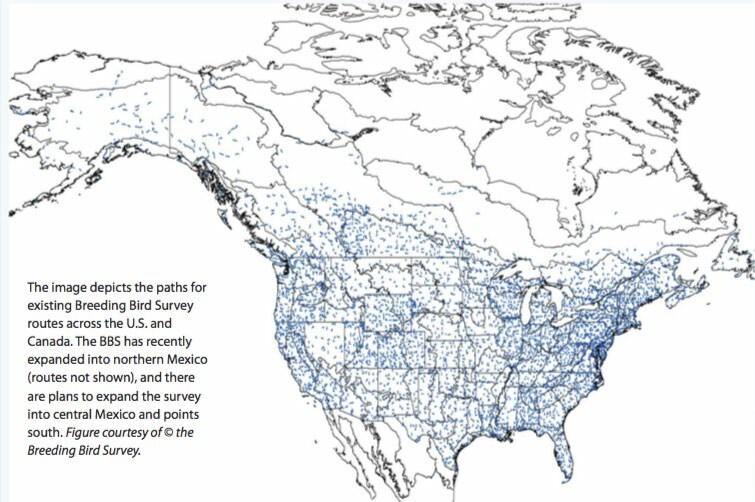 The North American Breeding Bird Survey, Results and Analysis 1966 – 2015. Version 2.07.2017 USGS Patuxent Wildlife Research Center, Laurel, MD. Downloaded 3/14/2018 from https://www.mbr-pwrc.usgs.gov/bbs. Siolkowski, Dave, Jr., Keith Pardieck, and John Sauer. 2010. “On the Road Again for a Bird Survey that Counts.” Birding, 42, (4), pp. 32-40. Downloaded 3/18/2018 from https://www.pwrc.usgs.gov/bbs/bbsnews/Pubs/Birding-Article.pdf. United States Geological Survey, Patuxent Wildlife Research Center. Trend and Annual Index Information. Downloaded 3/19/2018 from https://www.mbr-pwrc.usgs.gov/bbs/trend_info15.html. By mogreenstats in Land, Other Land on 2018/03/29 .